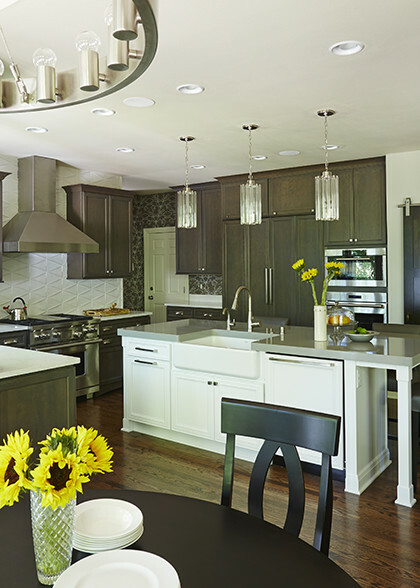 Rich walnut cabinets and triangle patterned tiles set the stage for a lively, contemporary home. A custom made sliding barn door with a glass porthole was separates the kitchen from the hall bar and formal dining room and gives the kitchen a unique flair. The cool neutrals and soft marble extend to the laundry and half-bath to create a peaceful, calming environment. Seeking a departure from her warm, traditionally styled kitchen, the client wanted spaces that were light yet sophisticated. Simple slates and whites allow deep wood finishes and natural light to shine and embrace a style that appears effortlessly timeless.